WILL: A Wonderful World is a story-driven puzzle game with a unique mechanic in which you influence varied characters and their narratives, attempting to find the best solution for all of those in need. You do this by affecting the story itself as you review and then edit letters, solve puzzles and immerse yourself in the cast’s varied fates. It is heavily rooted in Hong Kong, for example, but the cast and influences are wide-reaching. A young girl wakes up, groggy in an unknown room. A talking dog appears before her and she becomes startled by the revelation he tells her: They are gods and it is their duty to change the fate of any humans that ask for their help. Letters appear in the mail and with pen in hand she begins her job. A quiet nerd stuck in a hopeless, one-sided crush. An impoverished artist that has lost all hope and contemplates suicide. A rookie police officer who burns with justice and hopes for his first big case. A young woman desperately chasing her dream against all odds. Even a stray cat that would just like some dried fish to eat. With the power to change the fate of humankind, dive deep into the story and learn about those that seek out your help but, remember, changing someone’s fate could have an effect on others. As you read through each story, perhaps your memory will also return, but what will you learn about your character and her mission? Redesigned to perfectly tell the tale on Nintendo Switch. Receive letters from people seeking help. Investigate their situations and alter their fate. The stories of the characters are gradually revealed to you in their letters. From these letters you will learn about their lives and help solve their problems. Be sure to consider all details before making decisions; the fates of the characters depend on this. Life is full of surprises. Sometimes, thinking outside the box can uncover beautiful hidden gems. Be bold, be brave, and create the best memories together with our heroes! 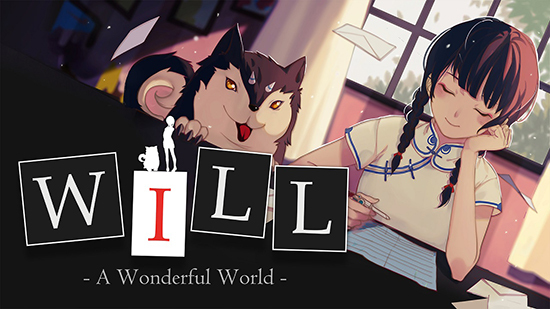 WILL: A Wonderful World, a title from WMY Studio with a ‘Very Positive’ user score on Steam, is arriving on the Nintendo Switch eShop on 18th October in North America, Europe, Australia and New Zealand. There will be a one week launch discount price of $11.99 €11.99 after which it will cost $14.99 €14.99.